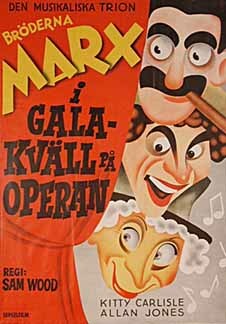 This was the Marxes' first film after leaving Paramount (well, after being pushed out). MGM producer Irving Thalberg took the boys under his wing to produce two of their greatest films (the other being "A Day At The Races"). 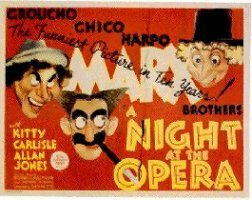 Thalberg's contention was that, although the Marx Brothers' movies were funny, you couldn't "build insanity on insanity." He proposed an actual story for the brothers to work against. He figured that there may be only half as many laughs in a picture, but the films would give the audience something to care about. 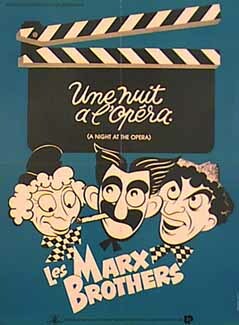 His hunch was obviously correct, as "A Night At The Opera" was the Marx Brothers' biggest grossing film (more than doubling the take from "Duck Soup" two years earlier). Although the brothers had difficulty with the way he handled business, Groucho proclaimed that Irving Thalberg was the only man he would truly call a "genius." Thalberg asked the Marx brothers whom they would like to write the picture, and of course they chose their two favorite writers, Kaufman and Ryskind. In this picture, Otis B. Driftwood (Groucho) tries to introduce Mrs. Claypool (Margaret Dumont) into society by arranging for her to donate $200,000 to the New York Opera Company. The company's director, Mr. Gottleib (Siegfried Rumann) decides to use the dough to sign Rudolf Lassparri, one of Italy's most well-respected tenors. Trying to keep his finger in the pie, Driftwood sets out to sign Lassparri himself, only to wind up signing Ricardo Baroni (Allan Jones) through his "manager," Fiorello (Chico), by mistake (check out a transcription of this scene, made available through the generosity of Angela Toma, at The Contract). 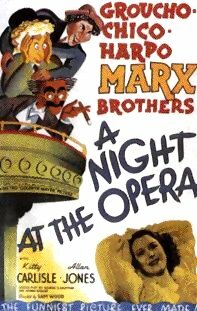 Add to this Rosa (Kitty Carlisle), the mutual love interest of Baroni and Lassparri, and you have a thoroughly entertaining film. This movie contains the now infamous "stateroom" scene. 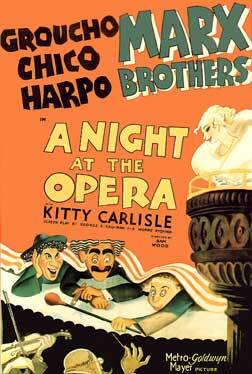 This was the Marx Brothers' first picture following the departure of Zeppo. Many purists contend that their movies just weren't the same without him. You be the judge. 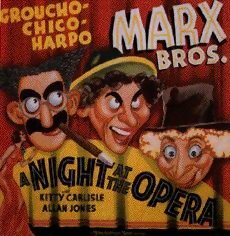 GROUCHO: Wait a minute. Have I got time to go back and pay my hotel bill? 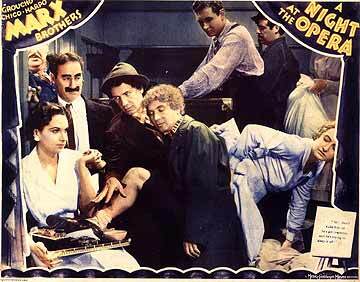 The following exchange between Groucho and Margaret Dumont -- Dumont asks, "Are you sure you have everything, Otis?" 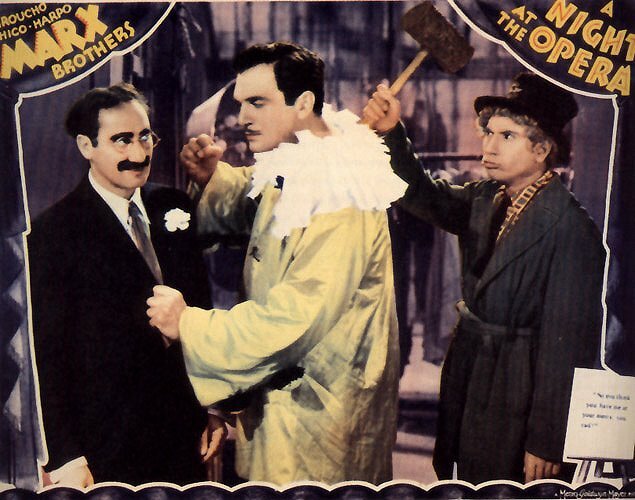 and Groucho replies, "I've never had any complaints yet!" 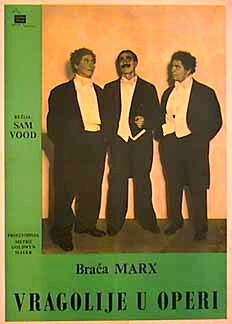 -- was cut by the censorship boards in every state on the film's release, but fortunately was preserved and is in current copies.